Clarence Gatemouth Brown is a musical icon. A modern day authority - who lived and grew up during the birth of most of what is being studied, milked and copied today. Although he's most revered by the blues folks, Gatemouth's musical chops are strong in many directions, because he's lived it. From the first cut on this album - Gate's own "Midnite Hour" - you know what a treat you're in for. A guitar tone that swings and sings over the changes, nice horn sectional work, melodic horn soloes, a cooking rhythm section that grooves on the bottom of it all, and Gatemouth's roots vocals as the icing on the cake. 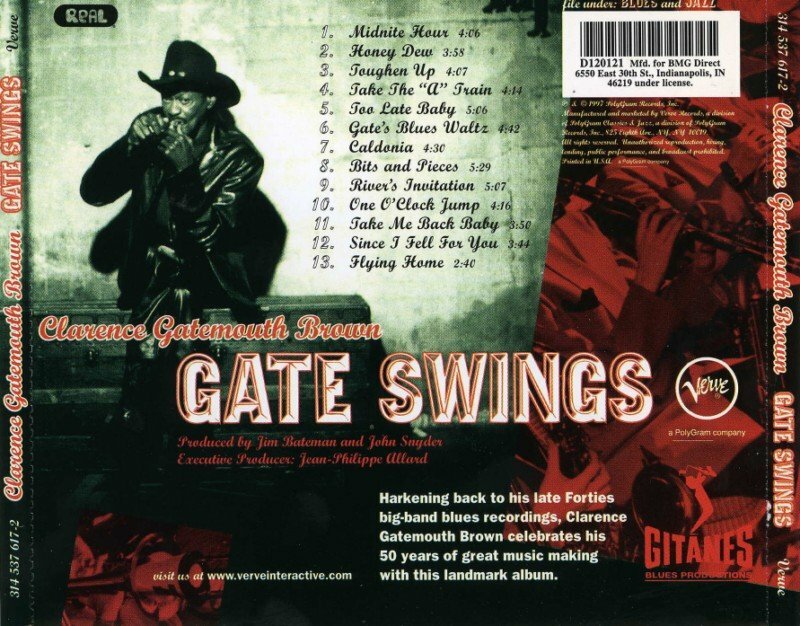 From the fertile beginnings of what we all hold most dear in music today - "the good old days" - Clarence Gatemouth Brown holds the intimate knowledge that comes from living through it all. 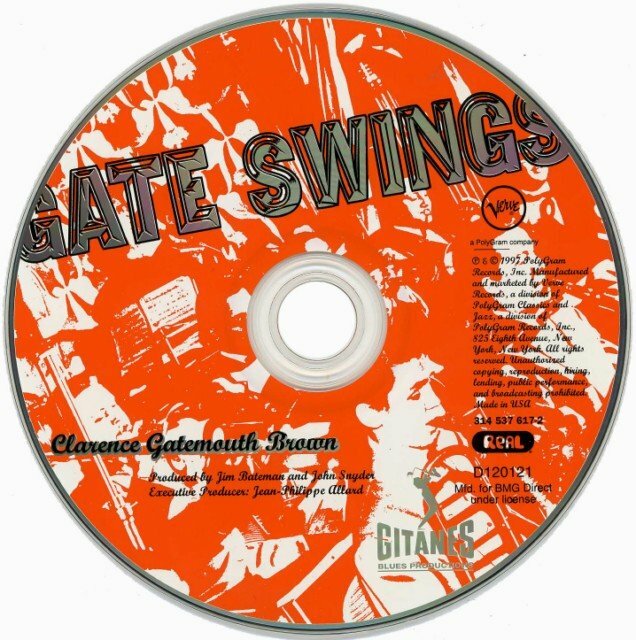 The arrangement of "Gate's Blues Waltze" is supreme...the interplay between the B3 and Gate's wonderful guitar, the sectional swells and the saxophone soloes, and a really grooving rhythm section all make this one of the standout cuts. Gatemouth attacks the ageold "Caldonia" like a 17 year boy with a high level of testosterone...attitude plus! The funkiness of Percy Mayfield's "River's Invitation" is a great addition to this album. 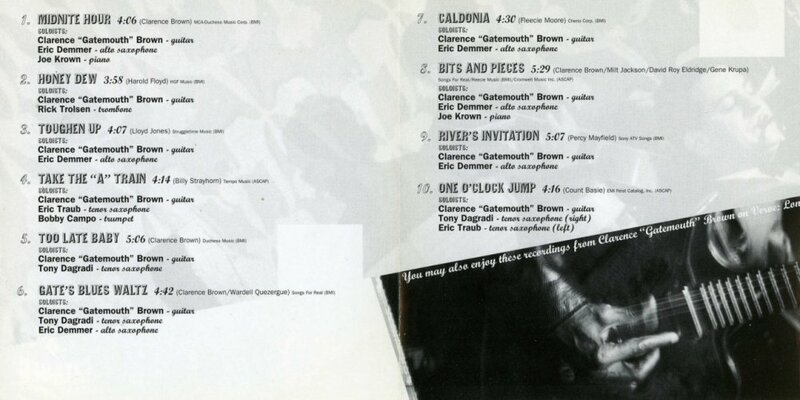 Listening to Duke's own "One O'clock Jump" will get you jumping and Gate is in top form here. "Bits and Pieces" which Gate co-wrote with Milt Jackson/David Roy Eldridge/Gene Krupa...puts it all in perspective. This is the real deal...swing, big band, blues, jump...label it what you want...but here is nearly 60 minutes of what it is! No talk about Gangsters...no Zoot Suits...and no Zip Guns...Just music music music. This album is a celebration - Party on! 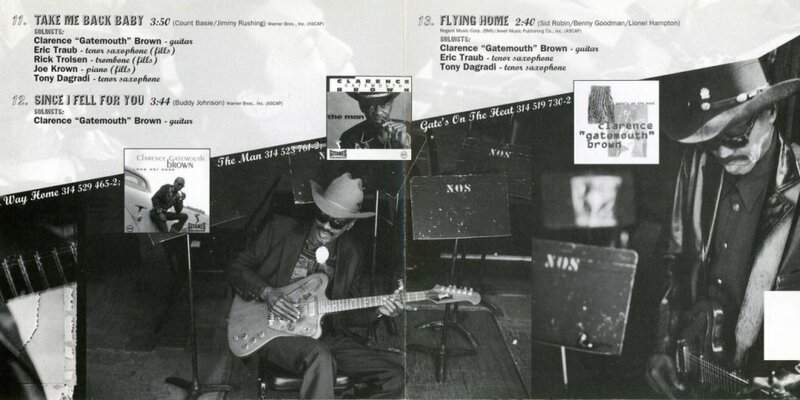 Clarence Gatemouth Brown: guitar, vocals, and rhythm section arrangements. Joe Krown: Piano, Hammond B3 Organ. Trumpets: Bernard Floyd (lead), Bobby Campo, Jamill Sharif. Trombones: Rick Trolsen (lead), John Touchy, Brian O'Neill, Richard Erb (bass). Saxophones: Ray Moore (lead alto), Eric Demmer (alto), Warren Bell (alto), Tonry Dagradi (1st Tenor), Eric Traub (2nd tenor), Anthony Frigo (baritone). Big band arranged and conducted by: Wardell Quezergue, Vocal Assistance: Gene Gunulfsen.